That’s a wrap on Too Much Information! Oh hey you guys! A lot of you have been asking where the Hell I’ve been / where the podcast has been / how I do such awesome handstands? Good asks. Well, I was shooting a brand NEW show called “Too Much Information” that will be airing sometime this Fall on Super Channel in Canada. The show is half hour comedy / variety panel show and I’m the host! If you need a more clear picture it’s like the British panel shows 8 Out of 10 Cats and Never Mind the Buzzcocks. Just a handful of panellists include: Carla Collins, Dave Merheje, Lauren Ash, Andrew Johnston, Mark Forward, Sitara Hewitt, Fraser Young, Aisha Alfa, Boomer Phillips, Kayla Lorette, Marty Adams, Justin Landry, Nicole Arbour and so many more! (I’m leaving out like 20 super talented people you have no idea) No word on an air date or if the show will air in the US yet but I will keep you guys posted. Now that shooting on TMI is done, I’d like to thank everyone at Lone Eagle Entertainment (especially Rachel, Mike & Sheldon) for giving me the opportunity to host such a fun show and everyone at CBC studios for letting us use Strombo’s old studio (I could still smell the tight shirts!). We shot 37 half hours of TV in 10 days which is an unbelievable feat. I couldn’t have done it without the best show runner in the biz Greg Lawrence, amazing writers Pat Thornton (who is also a panellist), Luciano Casimiri, Kathleen Phillips & Amelia Haller, director Shelagh O’Brien, Kevin Hunt, the fantastic crew and wonderful hair, make-up and wardrobe ladies and last but not least, the best warm up guy on the planet, Adam Christie. You guys are great and I miss you already (I’m also missing a million people on this list but if you’re reading this you know how I feel). Also, want to thank everyone for supporting the second season of Never Ever Do This At Home which had its première on May 12th. Make sure to check out the finale in 2 weeks! Teddy and I really appreciate the support on Facebook and Twitter. As for the podcast, I’m looking to do a re-tooling and relaunch in a month or so. So look out for that. I’m out of the rasslin’ game so expect cool dude chats with cool peeps. The handstands are just natural ability. … if you look down you can see my tweets! why not subscribe to this already? 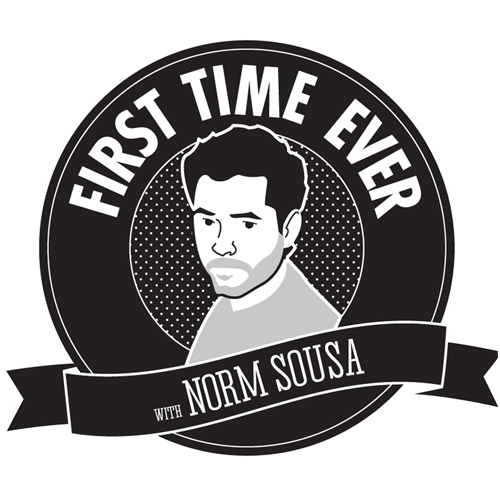 norm sousa · and more!